Have Your Own ONLINE CASINO and SPORTSBOOK up and running in no time! The online gambling industry continues to be among the hottest, most profitable businesses on the web because it combines the explosive growth of the Internet with man's natural interest in gambling. 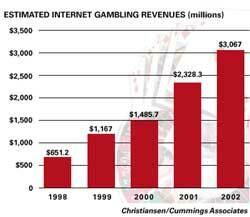 Industry experts project the population of online bettors will grow at an annual average rate of 39% and they estimate internet gambling revenues will reach US$3 billion by 2002. With profitability comes competition; therefore time-to-market is critical. In order for you to maximize returns, it is vital to choose the best partner from the start -- a partner who is experienced, innovative and highly reputable. Real Gambling Software assures you of wide product offerings, quick execution, industry leadership, innovation, secure transactions, comprehensive services and highly efficient e-business solutions. Real Gambling Software has accumulated over 15 years experience in gaming and hospitality-related industries and currently operates gambling sites that are market leaders. gambling entertainment service package available -- guaranteeing swift turnaround and seamlessly integrated online casino operation.